Inquisitor: We are both of the same people, Solas. Solas: The Dalish I met felt… differently... on the subject. he enters the scene in the beginning of Dragon Age: Inquisition. Massive SPOILERS across all of Dragon Age! He's so easy to overlook, at first. A humbly dressed companion in homespun, a male elven mage apostate with no vallaslin—with no markings to note allegiance to clan or god. He is a rather curious figure—pale, bald, and thoughtful, neither old nor young, and with a precise and mellifluous voice and a slightly reserved, cool demeanor. He's not especially buff, loud, or commanding. He speaks softly. He's nobody—not really remarkable at first glance. At least not in any obvious kind of way. And he certainly isn't your typical heartthrob. Meet Solas. 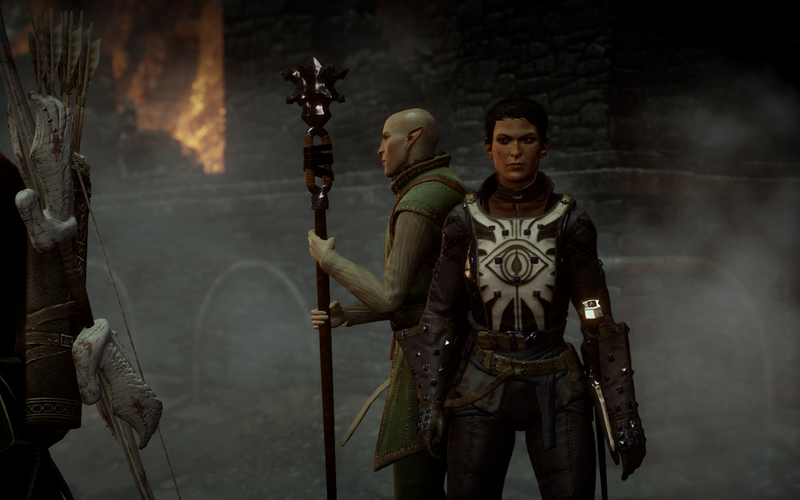 And given the sheer emotional heights of his final scenes in both Dragon Age: Inquisition and particularly in the DLC "Trespasser," perhaps the greatest irony to Solas's romance with the Inquisitor is how quietly he enters the scene in the beginning. And I love that. It's just so smart from a dramatic standpoint. Because, when we meet Solas, we barely get the chance to register him in all the tumult—we've been thrown into a world of war and terror that's raining green fire and demons, we're still intermittently begging Cassandra not to throw us back in chains, and we hastily meet Varric and Solas within minutes of battling our first demons and closing our first rift. In other words, it's all chaos and mess. Everyone's a stranger. Our Inquisitor (whom I'll refer to in the Lavellan character choice since that's the only person who can romance Solas) is confused and scared and tired. Either way, meeting Solas doesn't look or feel all that noteworthy, not in the moment—not least because it's also overshadowed by the return of our wonderful DA2 friend Varric, who's chatty and warm and instantly willing to befriend. Solas is by comparison relatively easy to overlook. Besides, again, we're still traumatized and learning on the run. We exchange a few quiet words and introductions, and then we're fighting onward, through snow and blizzard, through demons and fire, through derision and distrust. So it's understandable that many of us, we barely look over, especially in a first playthrough, at the quiet elven guy next to us. And that's exactly what he wants. I know plenty of fans keep looking longingly back to the disparate and richly varied race-gated introductions to Origins, but the introduction to DAI is so effective for me because it drops us into the action as an unknown, solitary protagonist who is whoever and whatever we create them to be—into a raw, violent yet beautiful world in which up is down and right is left. We start the story with no one—no family, no friends (we're not the Warden of DAO or the Hawke of DA2). We have no past beyond our near-death and resurrection as events begin. Nobody questions this, and it means a hellish introduction for our characters (especially our Lavellans) in the beginning, and we're further accorded scant support or empathy at first by those around us. Solas: You are Dalish, but clearly away from the rest of your clan. Did they send you here? Inquisitor: (my take: OMG YES BUT I DIDN'T WANT TO AND WTF IS HAPPENING). Bioware version: What do you know of the Dalish? Solas: I have wandered many roads in my time, and crossed paths with your people on more than one occasion. Inquisitor (in my mind): Sorry. Seriously. Also: Crap. Crap. Crap. It's a foreshadowing of our later discovery, in which we learn later on that Solas's awakening (or, rather, his reentry into modern Thedas proper) was very similar in some ways to our own. In other words, our situation, perhaps, mirrors his. In a romanced Lavellan, this parallel loneliness and isolation is something I find potentially really moving and fascinating. I believe it also contributes to a greater intensity in the relationship that develops between them, if that's the foundation, as well. They are lonely, cut off, yearning for connection they can never achieve. The parallels and implications are powerful, rich and startling. But even as we are thrown center stage, whether we wish to be or not, Solas keeps to the edges. Even after we arrive at Haven, Solas just hangs out over by his modest village hut, far from the Chantry building or the center of camp. He's there if we want to seek him out (and they're some of the most beautiful and lyrical conversations of the story if we do), but otherwise, he's pretty much invisible until it comes time to heal the Breach. He's barely noticeable, off to the side. Someone to provide some unexpected conversation if we run off to the edges of the village to talk to him. I mean, consider it: Our first meeting with Bull, when we encounter this larger-than-life figure carving his way through a swathe of bad guys in the midst of storm and thunder as the surf pounds beside him, it's downright mythic. Our first glimpse of Dorian is as beautiful and vivid as a fever dream in a shadowed future. Vivienne's entrance is all exquisite drama and masks and glitter and ice. Sera steps from the shadows like an arrow from the string; a spirit of vengeance against the abused weak and small. So many others, too, we meet in these florid, vivid, highly emotional moments. So I just love the fact that we meet one of the most important characters in the entire story in this rather casual, offhand way. It is also, notably, one of the few times in the game that Solas is not alone. wait... WAIT. When did he get so hot?" But that's Dragon Age. Nothing is quite as simple as it appears to be. For instance, if you're me, you start out by thinking, "Well, obviously I'm romancing Cullen because he's so handsome that it's kind of difficult to even stare directly at him—it's like looking into an eclipse or something" (and don't even get me started on Dorian or Cassandra or Varric or Sera, either), but then you end up talking to the quiet pale bald guy for three minutes, then catching your breath and going, "Wait... wait... WAIT. When did he get so hot?" Which just makes them seem even more realistic. For me, this first DAI playthrough, I ended up romancing Bull (who as I've already noted, I'd also found utterly unattractive at first, until I fell flat for him and realized how amazing he was, which was even better). I loved everything about it and have posted many, many walls of text about my reactions. Bull absolutely remains one of my favorite characters across Dragon Age. Still... I'd never quite gotten over my surprise crush on Solas, and even before I'd gotten to that final, powerful meeting between Solas and Flemeth, I knew I was going to romance Solas in the next playthrough. And then, of course, as I've described previously here on the blog, I finished the game and then did a fair amount of shrieking—in delight, horror, and frustration at the Fen'Harel revelation as well as at what happened to my darling, adored Flemeth (who is OKAY, dammit, she's FINE, she simply needs another trip to the spa LA LA LA CAN'T HEAR YOU). And, yeah, I've never restarted a game so fast in my life. I was determined. My next playthrough would be my canon. I'd play a Dalish elf again, but a quieter one, and I'd romance Solas. I'd pay attention to every single conversation, and enjoy my relationship with my lonely, elegant, brilliant, pixellated crush of the moment. I thought I knew everything, and that it would be fun. The best part of Solas's romance is, unless you romance him, you actually know very little. Because that's who he is; he doesn't show himself to just anyone. Even those he likes (or loves) as companions. So you have to romance him to really know him. And then, of course, it's too late. NOTE: Feel free to use this moment to cheerfully curse the genius of Solas writer Patrick Weekes (but please do so lovingly, because the poor guy does get a ton of flack simply for writing a character so complex and realistic that thousands of people fell in love with his character (NOT HIS FAULT), and to also add a hex on the tea-filled flask of our wonderful David Gaider, who (it turns out) came up with the entire diabolical idea of making Solas romanceable. Because he's a genius that way. And then Weekes was the perfect person to make that idea a reality. In a horrible way. In a horrible, wonderful way. The end result is that, like thousands of other unspoiled Solas-mancers, I had no idea what I was in for. No idea at all. ...All this, alongside a dozen other terrific and entertaining romantic choices across the game trilogy. Each of these romances has been created with real thought, care, and attention to detail, with each further illuminating both the love interests as characters, and the protagonist you're playing for, as a hero with his or her own fears, flaws, and strengths. And they're all beautifully written, designed and brought to life. No romance exists in a vacuum in Dragon Age, and each further enhances our knowledge of the other characters as well as of our own protagonists and who we shape them to become. immersive, and devastating of any romance across the trilogy... is Solas's. But for me, for sheer, lyrical complexity and emotion, by far the most entertaining, immersive, and purely devastating of any romance across the trilogy... is Solas's. Because, well... it gives us all things, in a storyline that's not just tied to the core story, it's braided to it, entrenched in it. With Solas, we get the many-sided fractal that is all the depth, connection, pain, love, fear, sensuality, loss and potential heartbreak of so many other Dragon Age romances in a single story if we romance him. His romance means love and loss, passion and high drama, sexual tension held to the very breaking point in conjunction with intense fear, conflict, belief, courage, and mutual depth of feeling. It's all romantic proclamations and doomed whispers; it's sorrowful glances and unexplained disconnect; it's all of this and more. It's love and connection in a world where magic still exists, and it feels private and pure until one of the most shocking moments in the game (if you're lucky enough to experience it, as I did, unspoiled). And it's all weirdly perfect, because Solas himself is a paradox, a creature of extremes—someone who's both spirit and flesh, hot and cold, gentle and fierce, abstemious and yet deeply sensual. And, of course, he's ultimately both cruel and kind. The worst things he could possibly be at once. But we'll get to that one later on. For now, let's look at his introduction. Solas is a wonderfully designed character (and kudos to the Bioware artists who did so) because his beauty, as with his secret identity, is hidden in plain sight. For those who don't look closely, Solas is just this bald, pale elven mage of medium height who wanders around with us and who maybe gets a little lofty and condescending from time to time. But for those who look closely, he's beautiful, unique, and unmistakable—a man in the prime of his life, slimly built, with a long nose and a distinctive, elegantly tapered jaw that both subtly echo his wolf-aspect, and with deep-set pale hazel eyes under straight, heavy auburn brows. His skin is pale and lightly freckled, and the portrait is completed with a beautifully shaped mouth and a cleft chin. His ears are also positioned, again, in this way that perfectly yet subtly evokes something of the wolf when Solas is viewed from straight-on. And of course he finishes the portrait with the ancient wolf jawbone he wears around his neck on a thin cord of leather. It's both clue and curse; it's who Solas was... and who he must always be. In other words, it's awful. And it's gorgeous. Ultimately, for me, in a visual sense, Solas is like one of those picture-puzzles you have to look away from, and then back, to see the hidden picture hiding beneath the picture. Once you do that, you'll suddenly see a collection of seemingly unrelated things turn into a wonderful image you never expected—a tree, a profile, a visage, et cetera, and this was also how I felt about recognizing Solas's handsomeness. And then you add Patrick Weekes's poetic and layered dialogue. Plus one of the most gorgeous and subtle voices in creation, with the voice contributions of talented Welsh actor Gareth David-Lloyd. It's a pretty volatile combination. Especially for the unprepared. There's a quiet subtext to Solas's earliest discussions that for me only becomes apparent upon replay or revisitation, which is primarily centered on his definitions of those he may or may not perceive as 'real.' This moment can be incredibly impactful based on what we know of Solas, what our relationship is with him in-story, and how open we have chosen to be with him. Inquisitor: I’d be interested in hearing your opinions on elven culture. Solas: I thought you’d be more interested in sharing your opinions of elven culture. Solas: You are Dalish, are you not? Inquisitor (among several options): Yes, I am. The Dalish are the best hope for preserving the culture of our people. Solas: “Our people.” You use that phrase so casually. 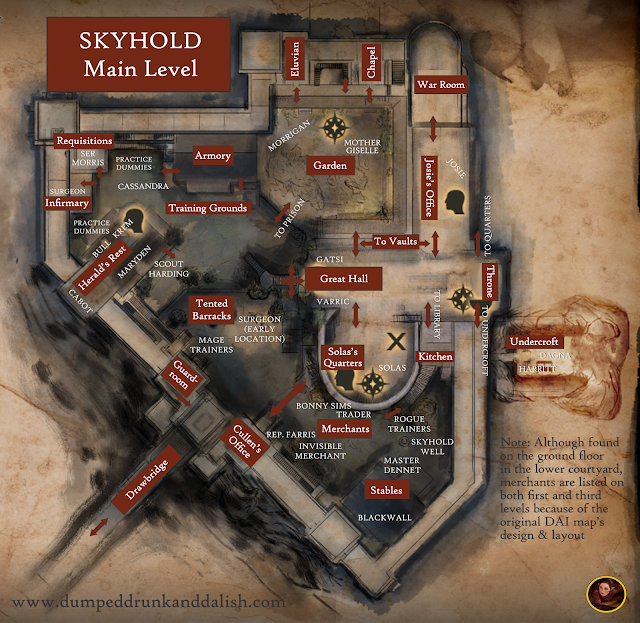 It should mean more… but the Dalish have forgotten that. Among other things. Inquisitor: Oh, but you know the truth, right? Solas: While they pass on stories, mangling details, I walk the Fade. I have seen things they have not. Suddenly, for a few minutes, I was as immersed in the game and moment as deeply as I can ever be captured by a book, a film, a piece of art. Suddenly, I was having an argument with a character in a video game who had also somehow managed to get under my skin and irritate me. Inquisitor: Ir abelas, Hahren. If the Dalish have done you a disservice, I would make that right. What course would you set for them that is better than what they know now? Solas seems like he might continue in anger, then pauses, and in a lovely subtle performance note by voice actor Gareth David-Lloyd, he sighs. Solas: You are right, of course. The fault is mine, for expecting what the Dalish could never truly accomplish. Ir abelas… da’len. If I can offer any understanding, you have but to ask. This is one of my favorite dialogue exchanges in the game. I especially love that Lavellan, instinctively, moves to use the formal elven here, falling back on her Dalish origins (but in a way he will share and respond to), to both apologize for the Dalish's treatment of him, and to ask, with respect, what she and they can learn from him. For me, it's a key, lovely moment, as is his use of elven to answer her in kind. It's incredibly important: It's Solas admitting, despite himself and his previous outbursts one intrinsic fact: That, yes, we are alike, you and I. Then their potential romance truly begins. At least, for me. In terms of my own story and protagonist, it's the first moment at which I feel the two realize they are more alike than different, and I still support the curriculum enough to keep them in mind. In addition, I'm always touched that he calls her da'len, or 'young one,' here, as well, in the formal response. It's less an expression of youthful inequality (although, of course, the disparity in their ages here is one of actual millennia) than one of, to me, addressing the forms. Responding within the ritual, as she has spoken to him. does... when he realizes the Inquisitor is more than a shadow or sacrifice. My favorite aspect of this exchange is the sudden, complex and precipitous drop in tension. 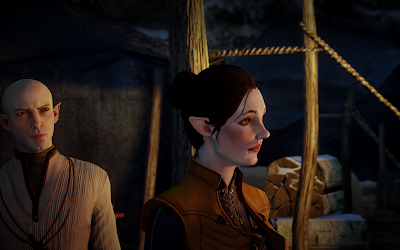 Solas is visibly surprised and moved by the Inquisitor's respectful plea for understanding. And then undone by the realization that, wait, this person is not an enemy. This person is listening to him. This. Person. And a dawning realization, appreciation, and terror, of that awareness surely accompanies this, right? He's already on the precipice. Because, for the first time, when Solas argues a point, when he expresses anger or frustration in this hostile and ugly, muffled new world in which he has found himself, someone else responds with love, acceptance and with a plea for better understanding. The only problem is, it's someone who's not supposed to intrude on his private circle of reality. They aren't supposed to do that. They aren't supposed to persuade. Or tempt. Or move him. In his world, the person who responds isn't real. They're a shadow, a shimmer, a ghost. Not real. Never that. Except... now, this. The possibility. A sudden kinship, a flashing awareness, a connection. And he is, after all, so lonely. Solas is a passionate and intensely feeling man. I think, right here, if there's a romance brewing, it's here when he falls flat. And it's therefore that much more believable that here is when the walls simply come down. And when they do, he thinks of Felassan. As he must. As he should. But more on that later. Meanwhile, ultimately, to me, Solas's romance is the best of all worlds, offering a little bit of everything, with the open sensuality of Bull's, the sweet, slight awkwardness and hesitance of Dorian's or Cullen's, the doomed passion of Anders, the hidden dramas, conflicts and guilts of Fenris or Blackwall's romances, and the sheer poetry and lyricism of Cassandra's or Alistair's. However, what makes Solas's romance wholly unique and different from those of the other companions across the trilogy, for me, is that it's the only way we'll really get the complete portrait of Solas, of who he is at his most open and unguarded. This isn't the case with the other characters—if you have high friendship, approval (or even rivalry), even if you don't romance Bull, or Anders, or Alistair, or Leliana, or dozens of others, you'll still walk away knowing who they are, even if, depending on your choices, Bull's romance does provide an unexpected glimpse of both his capacity for tenderness (or ruthlessness, depending on your choices), just as Sera's illuminates her capacity for both playfulness and cruelty if you're playing an 'elfy' Dalish Inquisitor. Nevertheless, there's not the disconnect with other companions that we get with Solas—we still get those glimmers of who we already know them to be, with or without the romance. But this isn't really the case with Solas, who's careful and reserved with every word, every glance, every touch. With Solas, you have to reach out. Talk. Open up. There's no other way. In other words, to know him, you have to be brave. Connect. There's no other way. Otherwise you never get past the barriers. If we don't romance or befriend Solas, we'll never really know how complicated he truly is. We won't see him lose control, whether in a kiss he cannot bring himself to break, or in his anguish at the prejudicial and senseless death of a friend. Instead, he comes across as a much more distanced character. He remains self-contained, cold, dismissive, and predictable. The elven mage who thought he knew too much, and who needed no one. Because distances can be bridged. Awarenesses can dawn. And love can awaken empathy, admiration, desire and understanding beyond imagining. For those of you who romanced Solas... how soon did you look over and realize? Were you as slow as me, or did you notice him sooner? "...as well as at what happened to my darling, adored Flemeth (who is OKAY, dammit, she's FINE, she simply needs another trip to the spa LA LA LA CAN'T HEAR YOU)." I love this. I may have accidentally sung that last part like the chorus to Deck the Halls. My first playthrough was human, so I didn't have the option to romance Solas. Alas, despite this, Solas and my Inquisitor ended up good friends. My main party consisted of Cole, Solas, and The Iron Bull (at the time, I had no idea Patrick Weekes had written all of them, so that was a hilarious surprise that I deem a tribute to his abilities). I romanced Solas when I found out my favorite character ('cause he was) was Fen'Harel in the surprise Flemeth ending (well, it was a surprise to me!). I spent the entire game hanging on his every word and looking for clues. I was also really sad that I didn't romance him first without knowing who he was because I could never unknow what I knew. Missed opportunity. I love your physical description of Solas, but I can't help but think about what really struck me - I've always wondered about the history in his character design. For example, Iron Bull and Cullen both have highly visible scars, but you never wonder about them. They're warriors, it's just who they are... but the scar on Solas' forehead? What about that obviously once-broken nose? Who did this bookish, frankly somewhat reserved fellow piss off? Thank you so much for reading and commenting! I always look forward to your feedback, and my experience with Solas was almost exactly the same as yours (I didn't romance him first playthrough). My take on the scar on his forehead is that it is a subtle reference to Solas removing his own vallaslin (and it's highly implied from Cole's comment in "Trespasser" that he did so after entering the flesh at the call of "her," whom I take to be Mythal). I love his nose -- I figure that he was dueling someone back in the ancient days and got a crack to the nose by a staff or weapon. He mentions that he was "cocky and hotblooded" in those days, so it would've been in character! 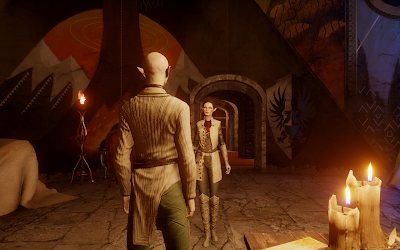 I love the way Solas's presence and romance kind of sneaks up on you. I barely noticed him, then suddenly just fell flat for him. Ma serannas, Teresa! I so appreciate your reading it, and am so glad you enjoyed it. Solas is such a complex character. But in the best way. This is one brilliant piece of writing! There is no better way to pay tribute to an artfully crafted story such as Solas’ romance than to write an analysis of it that is equally multilayered, complex and beautifully written. I have to admit -to my great shame- that I was totally fooled by the “quiet apostate” persona during my first playthrough as a human mage who ended up romancing Cullen. 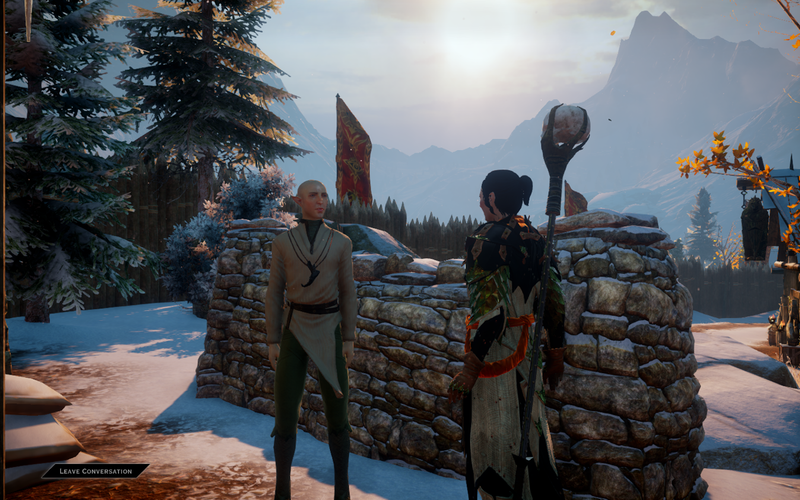 I did not pay any particular attention to Solas: he was somewhere in the background and that was all. During my second playthrough I was a Dalish mage and since Solas became a potential love interest, I decided to give the romance a try. I started really paying attention to him, engaging in conversation, listening carefully, flirting. And I found myself falling slowly under his spell. My reaction to his rich dialogue and his witty and unexpectedly audacious flirting was: "How on earth did I go through so many hours of gameplay without realizing that this guy is really hot?" The rest is history. My second playthrough was a completely different and much more powerful experience. I was profoundly moved by a game character and storyline in the same way I am usually moved by books or films. P.S "When it comes to lethal attractiveness, the whole is greater than the sum of its parts". I'm putting this on a t-shirt. Thank you for the incredible praise, Angeliki, and for the beautiful and literate comment. I felt exactly the same way. I still remember how completely uninteresting he seemed to be at first (because it's hilarious to me now), and the funniest part of that memory is when I went to talk to him at Haven, and I got the "heart" or "flirt" option, and I swear, I went, "Why would I want to FLIRT with him?" Then, of course, I did so anyway out of mild curiosity and that was the moment when my Inky would have keeled right over if that had been a possibility in the game. I've never gone from "Huh?" to "hot!" on a character so fast in my life! I remember my very first playthrough on DA:I. I started a female human warrior (my standard character across all games ever). I remember getting dumped into the game and trying to make sense of everything, and every time Solas would speak, I'd be like "Oh, he must be Exposition Man, because he conveniently knows a LOT about what's going on". Then I remember talking to him in Haven and being annoyed because I couldn't hit on him like I could Cullen or literally anyone else. I turned to Google to find out how to romance Solas and fell down a Spoiler-riddled rabbit hole (I tried to resist the spoilers for awhile, but I just couldn't hold out). By the time I emerged, the bags under my eyes were sagging to my knees and I was looking at Solas in a whole new way. 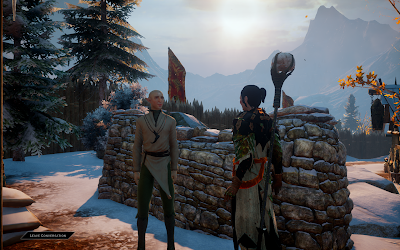 I immediately started an Female Elven Warrior and proceeded to romance the heck out of Solas. I never completed that playthrough, though, because I restarted (switched from 360 version to PS3 version, yes I have two copies of DA:I for two different consoles) on the PS3 as a Female Elven Mage. Still romancing Solas. Still never looking back. I remember being really torn early on between Cullen and Solas, and as I researched further, I felt myself being pulled more toward that angsty, destructive Solas romance, thinking somehow it could DEFINITELY end differently for me. That probably says more about me as a person than it does anything else.